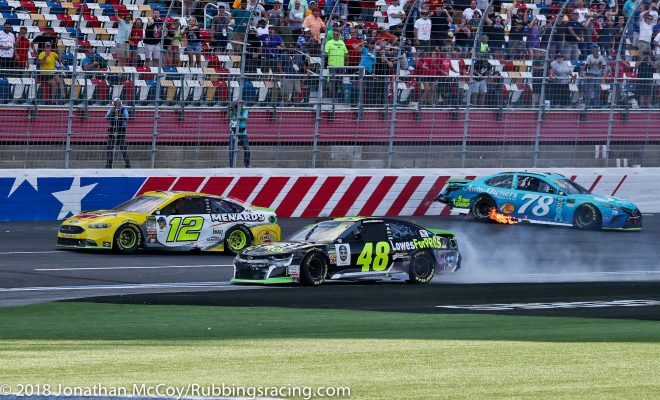 Ryan Blaney was third entering the final corner of the first Monster Energy NASCAR Cup Series race on Charlotte Motor Speedway’s roval, but when Jimmie Johnson lost control, taking out leader Martin Truex Jr., Blaney found himself driving to victory lane. This year, CMS’ fall date was the third and last race in the opening round of 16 in NASCAR’s playoffs. 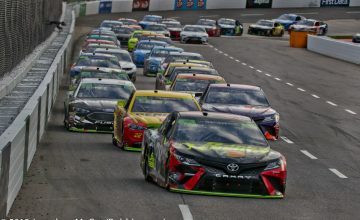 The event, being run on a hybrid of the usual 1.5 miles oval and the infield road course, has had teams worried since the schedule was announced last year. 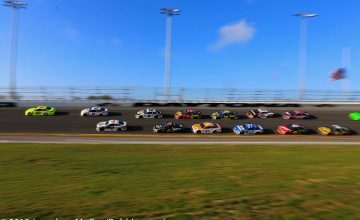 Eight drivers entered the race with the potential to drop below the top-12 threshold needed to move on to the second round of the playoffs. Blaney was the last driver above the cutline; he began Sunday’s race four points ahead of 13 place Clint Bowyer and six points ahead of Johnson. It was a get all the points you can get kind of day for Blaney. He wheeled his No. 12 Team Penske Ford to 10 in the first stage, good for one championship point. 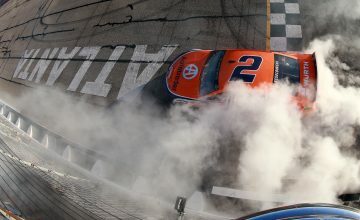 In the second stage Blaney outlasted Johnson to take the stage win, earning the team 10 championship points and one playoff point (a point he carries with him to the next round of the playoffs). Even with 14 points accrued during the stages, Johnson was still at risk of not advancing to the round of 12. Big picture racing wasn’t on the mind of the seven time champion; however, when he drove it deep into turns 17 and 18. trying to get his nose along side Truex, Johnson spun straight through the low speed corner. He collected the rear end of Truex, opening the road for Blaney to take the checkered flag. After righting his spin, Johnson pulled over and briefly stopped on the track — obeying NASCAR’s rule for missing a chicane — and then drove across the start/finish line. “I had been so good into that final breaking zone, I really felt like I could put some pressure on them and take a shot at it,” said Johnson. “I knew where I was on the math. I didn’t think that I was going to crash or spin trying to overtake him like I did. I thought I was making a calculated move and giving myself the chance to win and unfortunately it didn’t turn out that way. Thanks to late race cautions and mayhem coming to the finish line, Kyle Larson, Aric Almirola, and Johnson all ended up with the same amount of points. They sat in positions 11, 12, and 13 – one driver would be eliminated based off the tiebreaker. That tie breaker was each driver’s highest finishing position in any of the round’s three races. Larson was second in Las Vegans and Almirola was fifth last week at Richmond Raceway. Johnson’s eighth place finish wasn’t enough to continue his championship hopes.